NASA announced yesterday there are traces of water on the moon. But before you pack your bathing suit, it's probably still too soon to start planning for a lunar outpost and swimming pools on the moon. James Green of NASA says the moon is still very dry despite the discovery of traces of water. James Green is one of the NASA officials who made the announcement yesterday. He is the director of the Planetary Science Division at NASA headquarters. 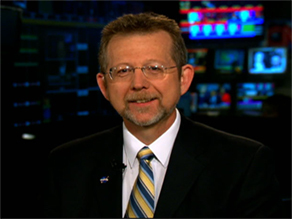 Green spoke to John Roberts on CNN’s “American Morning” Friday. Below is an edited transcript of the interview. John Roberts: Any photos we've ever seen of the lunar surface show it to be an arid and dusty place, yet this research shows maybe that doesn't tell the whole story. What did you find? James Green: John, that's right. However we didn't find the swimming pools or even mud puddles as you point out. The water that we found is trapped in the rocks. In fact, the observations from the Moon Mineralogy Mapper over the last six months as it maps the entire moon show that this water is everywhere on the moon. And, in fact, it's variable in terms of its content. But even with that said, the amount of water – it's drier on the moon than it is in our driest deserts. But it is a start in terms of looking more about what's going on at the moon, its origin, its evolution and we still have another big step to move where we're going to look at water that might be trapped in the permanently shadowed craters. We don’t know much about that yet. Will our kids pay through the nose? It’s a concern we’ve been hearing everywhere – in town hall meetings, interviews, newspaper editorials and blogs. Are we mortgaging our kids’ future to pay for health care reform? Many are worried that the younger generation, already burdened with student loans, other debt and a terrible job market, would bear the brunt of responsibility for paying for health care reform. Right now, our national debt is more than $11 trillion and rising. Although President Obama has promised he won’t sign any reform that adds to the deficit, it is still unclear how much the “young invincibles” – relatively healthy young adults – will have to pay to get themselves insured. Currently, about 10 million Americans aged nineteen to twenty-six don’t have health insurance, according to the Urban Institute. Janos Marton, a 27-year-old law school grad, is one of them. “I'm looking for private insurance right now and I can, I can afford some insurance, um you know, I'm not broke or anything, I have income. But right now costs are just out of control,” he says. Experts say that under the proposed Senate plan, a bare bones “catastrophic” policy for young people may end up costing them less than $200 a month, with an annual deductible of close to $6000. Critics say paying for reform will mean higher taxes – on something. What do you think? Will our kids pay through the nose? 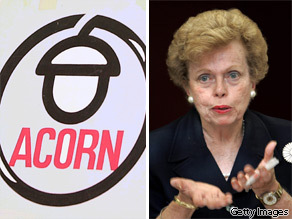 ACORN sign (L) and Ellen Sauerbrey (R). In this edition of "Wingnuts of the Week," the unhinged attacks on the Obama administration from GOP leaders continue while ACORN confirms its worst stereotypes and gives community organizing a bad name. On the right, the problem since the summer is that the wingnut fringe is blurring with base and influencing party leadership. That disturbing dynamic came into sharp focus this past week after a former Bush administration official claimed that the Obama administration was advancing "fascist, socialist ideals." Former Bush administration official Ellen Sauerbrey – who served as UN representative, Assistant Secretary of State for Population, Refugees and Migration and was a two-time GOP nominee for governor in Maryland – warned a September Lincoln/Reagan dinner audience: "I'm really afraid for the future of our country. Our Constitution is indeed being dismantled." The story was broken by The County Times of St. Mary’s County, Maryland, which said she characterized the president as being surrounded by “a cult-like following edging toward those of past dictators like Juan Peron and even Adolph Hitler.” When subsequently asked to clarify her comments, Sauerbrey disputed the article and denied having personally compared President Obama to Hitler, saying instead: “I think that we have a government that is following policies that are socialistic and fascist." When among the most accomplished members of the GOP start parroting paranoid talk radio talking points it’s a sign of the degradation of our civil discourse. Her fellow Maryland Republican Michael Steele might want to step in and restore some sanity. On the left, the wingnut of the week is ACORN – and it’s been a long-time coming. Long a symbol of far-left unaccountability and ideological excesses to folks on the right – despite their supposed non-partisan status – ACORN found itself facing a shocking video sting operation by enterprising conservative activists when workers in 4 cities eagerly offered a pretend pimp and prostitute tax and loan advice on setting up a brothel. One tape shows a worker allegedly offering advice on smuggling 13 underage El Salvadoran girls into the country to work there, including recommendations that the girls be listed as ‘dependents’ on the tax forms. The full tapes have yet to be released and at least one ACORN employee reported the requests to the police. But if the pattern holds true, it confirms the worst stereotypes – grassroots groups taking taxpayer dollars to undermine U.S. laws and values of common sense and common decency. The CEO of ACORN called the workers’ actions "indefensible." The House and Senate votes to strip the organization of federal funding and the White House dropped them from participating in the census. It was revealed that the IRS had placed $2 million in tax liens against the group's Big Easy headquarters and even Rep. Barney Frank condemned their actions in a statement released Wednesday. Amid an ongoing investigation and now a lawsuit against the journalist James O’Keefe and the Breitbart.com Web site that first posted the videos, it’s clear that from small stings big scandals can grow. Here are the big stories on the agenda today. Damning new evidence against the man at the center of a fast-growing terrorism investigation – and more terror arrests in separate alleged plots across the country. A video obtained exclusively by CNN appears to show Najibullah Zazi buying chemicals, namely hydrogen peroxide from a beauty shop in Denver. When asked why he needs so much hair care product, a clerk says he answered “I have a lot of girlfriends.” Zazi is now in federal custody. This is now part of what is being called the most serious plot since 9/11. President Obama is expected to make a statement at 8:30 this morning. The New York Times is reporting that the U.S., Britain and France will accuse Iran of building a secret nuclear site. But Iran may have beaten them to the punch. Tehran sent a letter to the international nuclear watch-dog, the IAEA, admitting that a second nuclear site does exist. “You kids are gonna pay, someday.” We hear older Americans say that every day about health care reform. But do young people care? Several polls say they are willing to pay more., but do they really understand what it's going to cost them? Carol Costello looks at some mind boggling numbers and the fallout for future generations. It’s one of the most amazing gold hauls in history. And it was by a jobless man with a metal detector. No, not “that guy” on the beach, but on a farm in Europe. You have to see it to believe it.